Zkittlez from Concrete Jungle Seeds, an exciting hybrid loaded with resin and terpenes, famous for its sweet aroma of fruity candy. 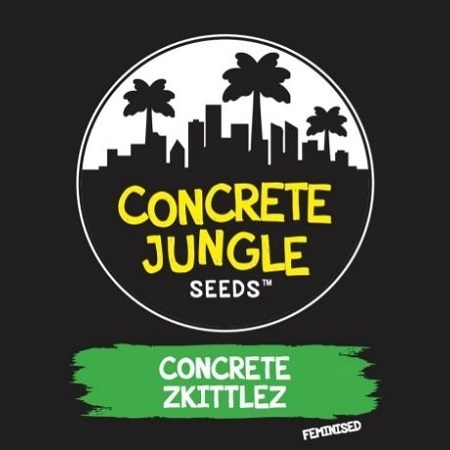 Concrete Zkittlez Feminized Cannabis Seeds by Concrete Jungle Seeds: Zkittlez from Concrete Jungle Seeds, an exciting hybrid loaded with resin and terpenes, famous for its sweet aroma of fruity candy. Now available online in our collection of feminised cannabis seeds. 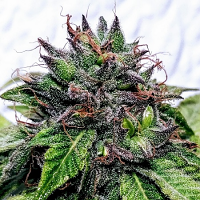 A hybrid of Grape Ape, Grapefruit and an Indica line, Zkittlez has 80% Indica genetics, which will result in fast flowering plants with a compact and stocky structure. During the stretch perioid at transition to flowering, Zkittlez usually doubles its size and, being vigorous and greedy, plants will benefit from generous doses of nutrients. 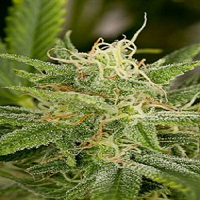 Fairly easy to grow, it responds well to different cannabis cultivation optimisation techniques such as LST or SCROG, offering heavy harvests after 8 weeks flowering. Once dried and cured, the flowers combine attractive colours ranging from light green to pink - purple, contrasting nicely with the whiteness of the thick resin layer that coats them. The aroma of Zkittlez is tangy, combining fruity notes ranging from grapefruit to lime on a sweeter background reminiscent of red fruits, while its effect is positive, calming, and physically relaxing.